New and comfortable furnishings Air conditioning, WiFi Internet and 2 TVs. 3 bedrooms, kitchen, living room and toilet. Fully equipped kitchen with crockery. Located on the first floor. In the center of Naples. One minute from the central station and the subway. 10 minutes from the airport. Bed linen and towels included. All washed and sanitized in the industrial laundry. Nice, spacious and newly built apartment. Everything inside is brand new. It is located in the center of Naples. 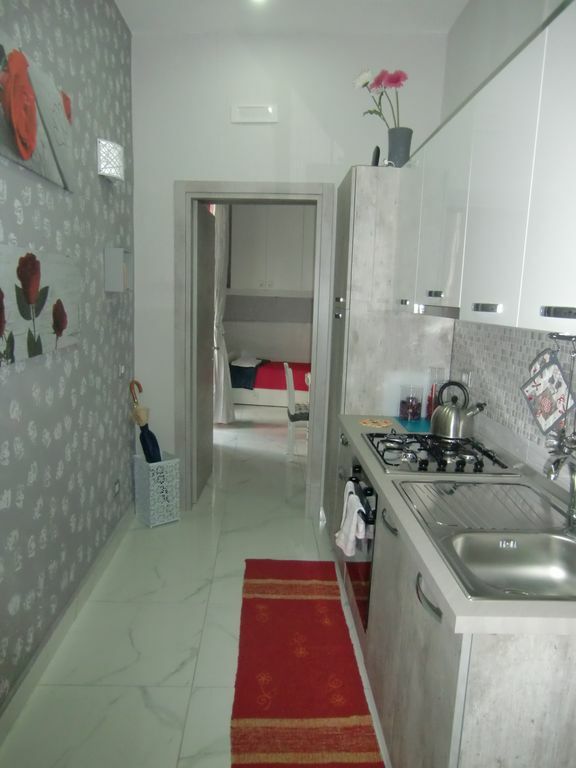 Bright apartment, with two balconies overlooking the street, with two bedrooms, a living room with a fifth bed, an equipped kitchen and a bathroom. Everything to live. It is excellently positioned on one of the streets adjacent to the central station, it is an excellent starting point for visiting Naples and the surrounding areas. The house is well served by buses and subways that stop within walking distance and can be reached easily from all over Naples. It is equipped with every comfort, TV, wireless connection, independent heating and air conditioning. Ideal for families and small groups of friends. The apartment is complete with everything and is located in a historic building. The apartment is located close to the historic center, where you can visit the Decumanos street of the old Greek city, Via San Gregorio Armeno, Church of San Domenico Maggiore, the church of Santa Chiara, etc. Also it will be easy to reach the oldest pizzerias in Naples (the pizzeria Michele is on the right a few minutes). La casa è composta da due camere da letto: una camera matrimoniale ed una camera con due letti singoli, che all'occorrenza possono formare un secondo letto matrimoniale. Inoltre abbiamo il wc, una zona cucina ed una zona soggiorno con un divano letto. La casa viene affittata per intero. Gli ospiti possono accedere a tutti gli spazi della casa. L'host sarà presente solo al check in, ed a richiesta può tornare nella casa appena l'ospite ne avrà bisogno. Nice, spacious and newly built apartment. Everything inside is brand new. It is located in the center of Naples. Bright apartment, with two balconies overlooking the street, with two bedrooms, a living room with a fifth bed, an equipped kitchen and a bathroom. Everything to live. It is excellently positioned on one of the streets adjacent to the central station, it is an excellent starting point for visiting Naples and the surrounding areas. Ideal for families and small groups of friends. The apartment is complete with everything and is located in a historic building. The apartment is located close to the historic center, where you can visit the Decumanos street of the old Greek city, Via San Gregorio Armeno, Church of San Domenico Maggiore, the church of Santa Chiara, etc. Also it will be easy to reach the oldest pizzerias in Naples (the pizzeria Michele is on the right a few minutes). From our house, in the historic center, it is easy to visit the city, either by public transport or by private means. Near the building there are bus stops for all directions, in Piazza Garibaldi there are metro line 1 main stop, and there is the Circumvesuviana railway station, from which you can easily reach the Vesuvius, Pompeii, Herculaneum and Amalfi. Sorrento. A few minutes walk and you get to the port where you can take advantage of the sea transfer with ferries and hydrofoils to the islands of Capri, Ischia and Procida, the Sorrento Peninsula and the Amalfi Coast.